What’s an email sign up form? 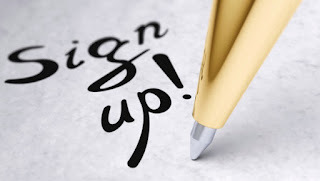 An email sign up form is an embedded or hosted web form you can place or link to on your website, blog, or social media sites so that a visitor can sign up to receive a newsletter or email. Typically, it’s a small box that asks for few fields including an email address. They may also be referred to as email opt-in forms, web forms, webforms, or signup forms. What’s the purpose of an email sign up form? It’s a small, but a mighty tool used to collect permission-based email addresses. You may have noticed the emphasis on permission-based. That’s because when a visitor fills out a sign up form and asks to be added to an email list, they’re actively agreeing to be a part of your list and giving you permission to send them email. These contacts are priceless because they’ve specifically asked to hear from your business and are highly likely to open, read and click your messages. This results in more visits to your website, blog, brick and mortar location, and hopefully more sales. Where should I put my email sign up form? In the examples below from organic skincare company, Birdy Botanicals, you can see how they prominently feature an email sign up form on their website, blog and their Facebook page. What information should my email sign up form ask for? Less is more when it comes to your form. Often, just an email address is all you need. However, if you want to personalize your emails or do any segmenting of your list, you may want to add a field for first name, state or other relevant information. How do I get an email sign up form? Most email service providers (ESPs), like VerticalResponse, offer either email sign up forms you can embed on your site or hosted web forms. In VerticalResponse Classic, you can find email sign up forms in your account in the Lists or Contacts section. You can quickly and easily customize your email sign up form and then post it wherever you like. And, once you have it on your website and other places, each time someone fills it out, their email address will be automatically added to your email list. There you have it, everything you ever wanted to know about email sign up forms. You can create your own in VerticalResponse now and start growing your list today. Have a question we didn’t answer? Share it in the comments and we’ll get right on it.